Tupperware Twinkle Straw Star is an innovative way to promote self-feeding at an early age. Designed especially for kids between 18 to 36 months, this tumbler looks appealing in bright green and yellow. The ergonomically shaped bottle fits comfortably in those little palms. Put on the lid with the built-in straw to use it as a sipper and remove the lid to use it as a tumbler. 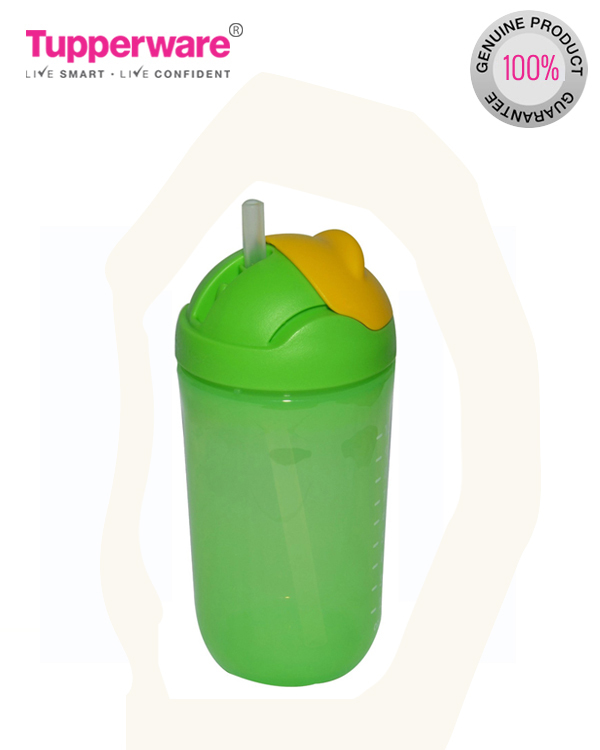 Clear markings on the bottle indicate the quantity of water or juices that the spill-proof Tupperware sipper can hold. It has a maximum capacity of 300ml or 10oz, which is a sufficient amount for your toddler. Sized just right for your little one, this Twinkle Straw tumbler comes with other child-friendly features too. It comes with a detachable straw for easy sipping. The straw is built into the lid and covered with a yellow cap when not being used. This 350ml straw tumbler is also compatible with the handle of the Twinkle training cup. The handle fits perfectly around the spout to offer easy grip. You can easily remove the straw to clean the sipper and put it on again in a snap. Plus, the brush included in the package lets you clean the straw with effortless ease.